Stone Cottage Adventures: I've Been Featured!! * Stone Cottage Dog Biscuits * have been featured over at The Rhinestone Beagle !! It is the cutest blog. If you have furry family members, you absolutely must check out the action at The Rhinestone Beagle ! I'm just dying to make these darling dog portraits! We have five dogs. I'll need to buy construction paper in bulk! 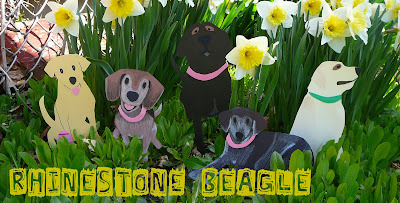 The name of the blog The Rhinestone Beagle just makes me smile! Give them a visit!